Two nights ago, while busily digesting a host of Christmastime snacks, I settled into my wife’s parents’ couch and watched E.T. for the first time in 25 years. It left an indelible impression in me then, when I was 6 or so. I cried and cried while watching it, mostly due to the trauma endured by E.T. as he suffered a night in the creek and subsequent pokes and prods from adults who couldn’t understand him. Ever since then, my memory of the film has been a mixture of fascination and horror. Songs from that era – Toto’s Rosanna is the most glaring example – evoke a dread deep inside me. I’m not kidding. E.T. really hit something for me, a scariness that only adult life can provide, an awareness that children are blessed with an intuitive understanding of things that slowly, inevitably fades away. And that something scared the crap out of me (so did E.T.’s cry as he lay on the operating table in the makeshift sterile workshop of Elliot’s house). Watching it the other night I realized that in addition to being scary as hell – or probably because of that – the film is wonderful. It fully captures the wonder, excitement, and ominousness of being a kid. The adults in the film just don’t understand; they’re either faceless government stooges or a mom who’s too busy to notice the alien standing in her kitchen. Good lord what a magnificent picture. I remember from my childhood that E.T. was exciting and sad and funny and full of wonder. And how the dynamics of Elliott’s family felt very real — not like a movie family living in a house on a soundstage, but like a real family living in a real house. What struck me watching it now is how incredible Spielberg’s filmmaking is, how pitch-perfect the performances are, how gorgeous and evocative the cinematography is, and how clever and honest the script by Melissa Mathison is. I’m used to frequently disparaging Steven Spielberg as a melodramatic has-been. And he is. But there was a time when he had had the tone of childhood and wonder just right. Close Encounters of the Third Kind was getting there and Jaws approached it too. But this time, he just got it. E.T. is told from the perspective of the children who discover, hide, and love E.T. 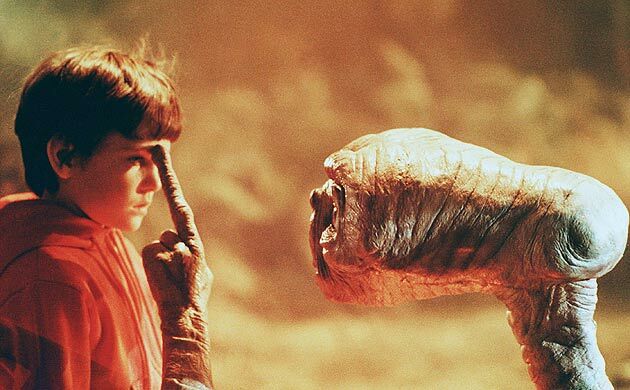 Elliot’s closeness with E.T., to the point that he can feel what E.T. is feeling, is something that only children can feel, before adulthood corrupts them and closes them off to the miracles hiding under ever stone and around every corner. The pace of the film is childish too. It’s not slow, but not too fast. Certain scenes, like when Drew Barrymore dresses E.T. in women’s clothes, go quickly and have the pacing of comedy. Others, like the wonderful, dreamy moment when the three siblings take E.T. trick-or-treating in a new Californian housing development, with the low Californian sun setting overhead, remind me of my own incomplete memories of childhood. And don’t get me started on the epic moment when E.T. takes Elliot and his bike for a ride across the sky, with the giant moon as a backdrop. That scene is so imprinted in our minds that we forget how fantastic it was when we first saw it. I can’t wait to show this film to my son. It held up much, much better than other films from the same period (think Teen Wolf). It just might take 30 years for him to appreciate it like I finally do.